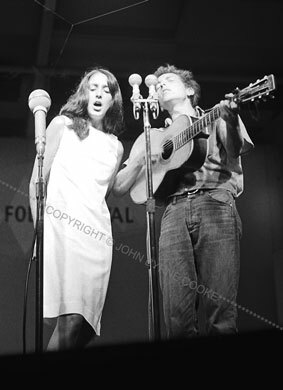 By the summer of 1963, when Bob Dylan made his first appearance at the Newport Folk Festival, Joan Baez was the queen of folk music. She joined Bob to sing "It Ain't Me, Babe," in his debut set Friday evening, and she brought him out to join her (shown here) when she closed the festival on Sunday evening. That fall, Joan introduced Bob as her special guest at a series of concerts. Her support did much to help Dylan establish his reputation. At the same time, Joan's inclusion of several of Dylan's songs in her repertoire broadened her appeal to the young social activists who were making the sixties a decade of protest.